Smoocher the ginger cat came to Moosey's Country Garden in December 2004 with his sister - two small squeaking six week old Christmas kittens. She was content to sit, and squeak, and look cute. 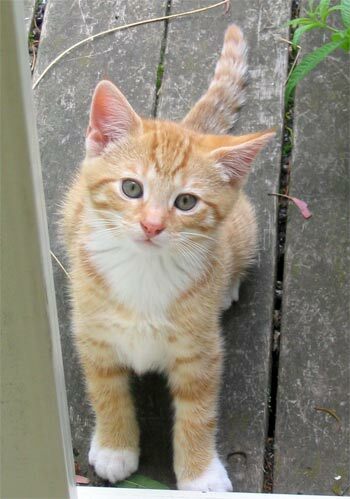 He bounced over chairs, and jumped over benches, and wriggled out of cuddles - he was a kitten on the move. Smoocher immediately started accompanying the head gardener and the puppy on morning walks. He'd race between protective trees, scoot up their trunks, then leap down to catch up. He had boundless stamina, and as the walking circuit grew, he just kept following. Even as a small kitten Smoocher had no fear of the outdoors - a bouncing puppy zooming over the paddock, the next door spaniel racing along the fence-line - no worries! Cats respond to human cuddles in different ways. Tired Smoocher was oh so relaxed - totally smoochy, purring loudly, happy lying on his back with his long orange legs flopping in the air. Half-Tired Smoocher would arrange himself square and symmetrical when picked up, his long front paws fully stretched, and his back nearly horizontal. Clasping this cat tightly to one's chest just didn't work. And as for Smoocher the Fully-Awake? He'd be too slippery and wriggly for more than the quickest embrace. Smoocher was the most versatile of the gardening cats. He'd happily climb a nearby tree while the head gardener poked and prodded the soil below. There'd be the occasional leap of faith - down onto the crouching gardener's back - ouch! And much expressive cat-talking and loud purring. There were no barriers in Smoocher's world - he'd follow the gardener right to the end of the back paddock if that was her destination. Smoocher first became sick when he was seven months old, and had to have cat-chemotherapy. For a while he seemed to be winning. But sadly his illness regained control, and in the third week of July he died peacefully at the vet's. But even though the little orange catlet had the shortest of lives, he had time to make a huge contribution to the Moosey Animal Farm. His influence lives on. Ask the other cats! Check out the Moosey fridge - chicken mince, premium diced beef... And check out the pantry - tins of gourmet cat food (like roast chicken and liver pate, Smoocher's favourite). And there's no more cheap dried food, thank you very much Smoocher, nothing but the very best and most nutritious! I am very, very lucky that I had such wonderful cat-company in the house and the garden - even for a sadly short time. 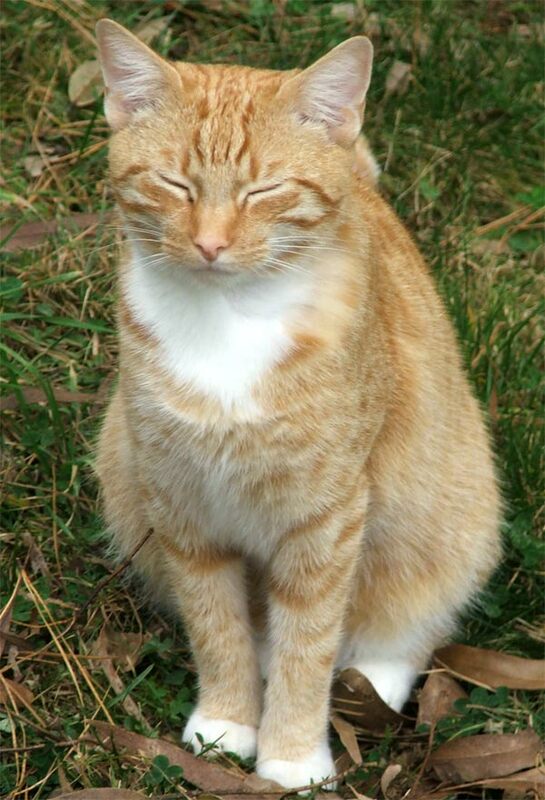 A white flowering cherry tree has been planted to commemorate the living and passing of this brave little orange cat. Sincere thanks to our wonderful vet for all his time, research, treatment and care.